Gerald Mitchell was at the peak of his musical career in the 1960’s and 70’s. He was referred to as “The Labrador Balladeer”, and perhaps could have been called the Woody Guthrie or Pete Seeger of the Big Land. Together, with his song-writing partner, Byron Chaulk, they composed numerous songs reflecting traditional Labrador life. 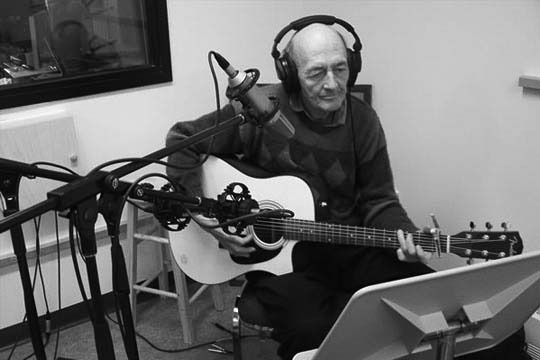 As a recording artist, composer and performer, he inspired many succeeding Labrador artists such as Harry Martin, Shirley Montague, Donna Roberts and more. Gerald contributed greatly to the catalogue of Labrador songs that remain in the hearts of Labradorians, and no doubt will find their way into the repertoire of future artists. Gerald has given us one of the greatest gifts – the gift of music. In addition to his musical contribution to the cultural fabric of the Province, Gerald is also a celebrated and accomplished visual artist. Today, Gerald lives in his home town of Makkovik, Labrador, where he still finds ways to express himself through his artistic versatility.